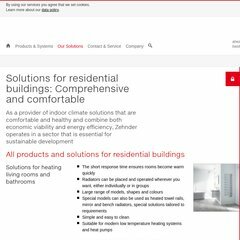 Topics: Designer Radiators, Decorative Towel Rails, Extractor Fans, Zehnder Comfosystems, and Zehnder Group Website. It is hosted by Dh-sr-nix (England, Leeds,) using Apache/2 web server. It is written for PHP/5.2.17 language. Its 2 nameservers are ns1.turbodns.co.uk, and ns2.turbodns.co.uk. Its server speed is measured at 892 milliseconds.